About Gina - Comedian. Writer. Laugher. Slacker. Single mommer. Co-creator of 4 boys. 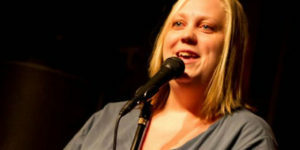 Momster Gina is a stand-up comic and writer for the Bay & Sacramento areas, the Pacific Northwest and beyond. She’s a talker, slacker, laugher, observer, single mommer and co-creator of 4 smart-assed boys, preschooler to teen. She’s making her way quickly through the comedy world and is sought after for her memorable and snarky take on real life, divorce, parenting and current events. Gina’s a funny comedy show host, feature and a “natural” radio show guest. She’s a solid hit with men, women and felons alike. Born and raised a 30-year New Yorker, Gina Ritter moved to the Napa Valley in 2006. Since then she’s become a Certified Californian Namby Pamby and hugs random people for no good reason — other than to try to get their wallet. Life, love, motherhood, travel, and crackheads make GREAT ideas for columns, books, and comedy! Her other projects and hobbies include surviving motherhood, driving as if she’s running away, and trying not to get pregnant. Or married.